Sprint Corporation S has offered customers more options by unveiling a bouquet of best-priced unlimited plans to cater to increasing demand for add-on services. In addition to unlimited data, talk and text at an attractive price, wireless customers can now benefit from additional features like HD streaming and entertainment services, experienced on a reliable network. Sprint’s four new plans are perfectly tailored for varied customers. The Unlimited Plus plan offers unlimited data, talk and text with more mobile hotspot data, TIDAL Premium music streaming and the TV you love, with Hulu, HD streaming and additional global roaming options at an unrivaled price. Its Unlimited Basic plan is aimed for customers who may not need additional features but want unlimited talk, text and data and Hulu, at an enviable price. The Unlimited Military plan will cater to the veterans, active duty and reserves of the U.S. armed forces. Lastly, the Unlimited 55+ plan is designed for people who are 55 or above, offering them exceptional value. With such innovative service offerings, Sprint’s customers will experience the Network Built for Unlimited at the best price. With more mobile broadband spectrum capacity than any other U.S. carrier, Sprint's network is built to meet customers' growing demand for data. The company’s 4G LTE network is the most improved in the United States with national average download speeds up 30.9% year over year. Moreover, Sprint has been making huge network investment over the years and its Next-Gen Network build is well underway. Customers across the nation are enjoying better coverage, reliability and speed than before as the company upgrades cell sites to triband service using 800MHz, 1.9GHz and 2.5GHz, adds new cell sites, densifies the network with more small cells, and prepares to launch mobile 5G in first half of 2019. 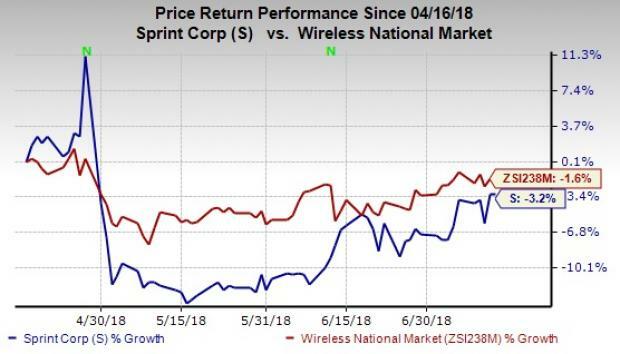 In the past three months, shares of Sprint have lost 3.2% compared with the industry’s decline of 1.6%. Perhaps the launch of these new unlimited plans with unbeatable packages will likely pull the sagging shares of the company in the future. Sprint currently has a Zacks Rank #3 (Hold). Better-ranked stocks in the industry include Comtech Telecommunications Corp. CMTL, Micron Technology, Inc. MU and Juniper Networks, Inc. JNPR. While Comtech and Micron sport a Zacks Rank #1 (Strong Buy), Juniper carries a Zacks Rank #2 (Buy). You can see the complete list of today’s Zacks #1 Rank stocks here.